We've created a "master list" of organizations, transit companies, faith-based groups, and Common Cause volunteers offering free rides to the polls across Wisconsin. If we want our democracy to work, we have to show up. But for those without transportation to the polls, “showing up” can be tough, if not impossible. 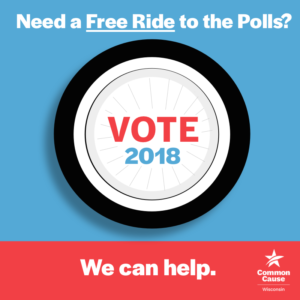 Prior to each Fall Election, Common Cause in Wisconsin identifies and recruits organizations and individuals statewide willing to give free rides to the polls on Election Day and/or during the early voting period. We then develop and aggressively promote a statewide “master list” of these ride options. Here is our Statewide list of free rides to the polls for the 2018 midterm election. Check back often as this list will be updated when more organizations and volunteer drivers are added. Our goal is to help ensure that all eligible voters in Wisconsin are able to make their voice heard at the ballot box by raising awareness that help is available in communities across the state. Our volunteer drivers also receive election protection training and resources (on voter photo ID and same-day registration), so they can make sure their riders are ready to vote when they arrive at their polling place. Would you like to be a part of our current “free rides to the polls” effort for the fall midterm election? Become a volunteer driver within your community–or help us identify individuals or groups in your area willing to pitch in and give someone a ride.